Sometimes it can seem as though film is set to disappear up it's own fundament but every now and again something appears to renew hope. 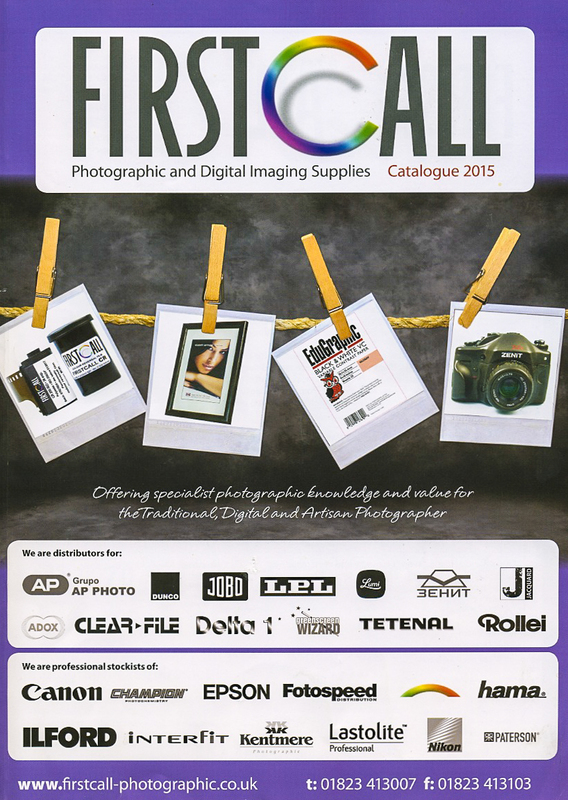 This time round it's the turn of Firstcall Photographic to give us a shot in the arm with a 162 page catalogue quite a bit of which has something of interest for analogue photographers. Firstcall, along with the likes of Silverprint and AG Photographic, are one of the mainstays of the UK film scene and it's good to see that they seem keen to linger. Their inventory of analogue gear covers everything from film, paper and chemicals to processors and enlargers. The company contacted me to say that they'd be happy to mail readers a free copy on request and it's well worth having. You can reach them by email here and it would be good if you could mention The Online Darkroom in your message. There's a lot of stuff in the catalogue I'd like to bring to your attention but the best thing to do would simply be to ask for one yourself! However, a new range of Firstcall-branded 5x4 film looks interesting. It comes in 100 sheet boxes individually packed in 25 sheet bundles and costs £74.99. It's a 400 ISO film that's about half the price of HP5 Plus. There is some slower Foma 5x4 on the market that's a bit cheaper but quality control issues seem to rear their ugly head from time-to-time with this film according to some internet forums. I've no personal experience of that so can't comment. There's also a range of 18 enlargers, including one made specially for Firstcall by German company, Kienzle, and a whole lot of darkroom kit from print dryers to mount cutters to negative storage options. In short, if you use film, develop and print in the darkroom you're almost certain to find what you need in this catalogue. thanks Bruce - just ordered a copy! They have a great range of products but they charge £7 postage on everything. It's a good delivery service, but sometimes I just need a new bottle of developer or something, and it's crazy paying 50% again just for postage. If they had a cheaper option for small orders they would get a lot more of my custom. Hope they see this and take it on board. What do people across the Pond do? Normally, we'll use Freestyle. But, there is also UltraFineOnline, and a few others. With Craigslist, we have a robust used market. And, of course eBay when we are very desperate. I have Arlington Photo in TX that still carries a small amount of developers and fixers on the shelf. They are the only game in town.